Fireworks could have sparked a fire in the Bronx that hurt left people homeless and injured firefighters. Checkey Beckford reports. 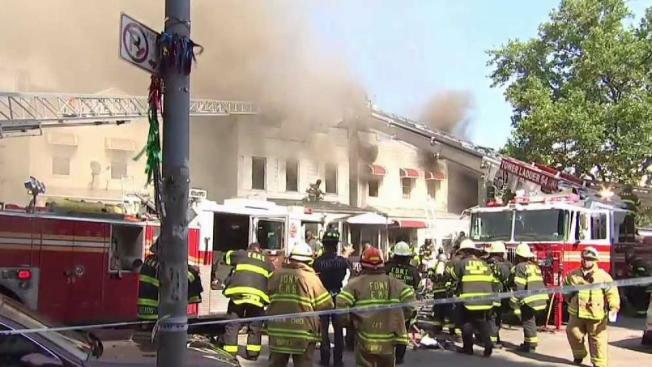 Nine people were injured, including eight firefighters, when a fire consumed multiple buildings in the Bronx, officials said. The most seriously injured firefighter was in stable condition Thursday night, hours after the fire spread to six apartment buildings shortly after it broke out around 3:30 p.m.
More than 160 firefighters responded to the smoky inferno at three two-and-a-half story homes on the 1100 block of Olmstead Avenue in Soundview, officials said. Heavy flames and black smoke were billowing from the buildings, Chopper 4 video shows. The flames got so intense at one point that part of a roof collapsed. Six people were injured, including a firefighter in serious condition, after a fire spread to three residential buildings in the Bronx on Thursday evening, officials said. Checkey Beckford reports. It wasn't immediately known what type of injuries the seriously injured firefighter incurred, but he was stable and talking Thursday evening as crews continued to put out hot spots. He was later able to be released from the hospital, firefighters said. Seven other firefighters suffered smoke inhalation, and a civilian had minor injuries, according to officials. Firefighters are eyeing fireworks as the cause of the blaze, but the investigation is ongoing. There were reports from witnesses who said they saw children playing with fireworks behind the same buildings that later caught fire. Families wiped away tears as they watched firefighters battle the inferno. Lyza Rodriguez said, "We lost everything." The Red Cross said that it's providing emergency assistance to nine households, including 20 adults and five children. 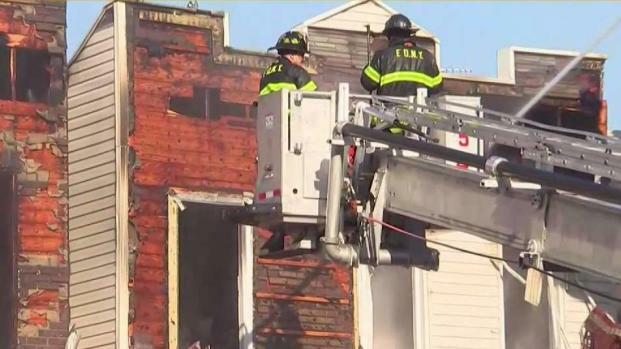 A mother and her 13-year-old son told News 4 New York that they ran from their home without the shoes on their feet after they saw smoke. The witnesses also said they heard pops. An FDNY firefighter was in serious condition Thursday after he or she was injured while fighting a fire in the Bronx, officials say. Christian DeJesus, 13, said he went to his mom and his brother after seeing thick smoke outside of his apartment. "I was in the room watching TV and just saw, out of the window, some smoke come out," 13-year-old Christian DeJesus said. "I went closer to the window and all I saw was black smoke rise."